There are many PC users like you that are being troubled and complaining about “USB ports not working” problem. Well, there are some reasons why your USB Ports are not working, and we will briefly discuss several of these reasons together with some of the solutions tested by PC users out there who experienced having problematic USB ports. One of the reasons why PC users like you encounter “USB Ports Not Working” troubles is because of missing device drivers. 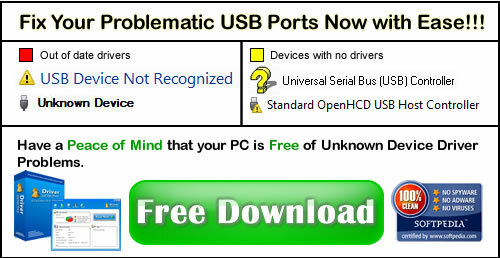 Some PC users forget to install their USB controller drivers after a fresh install of OS, so when they try connecting a USB device on their PC, that is the time when they notice that all their USB ports are not working. You can also experience having USB port trouble all of a sudden, and there are three possible reasons behind this. The first reason might be due to incomplete or unsuccessful connection between your USB device and your computer through the USB port. The second possible reason that can result in problematic USB ports is because the installed USB controller drivers have been corrupted or deleted. And considering the claim of some PC users, the third reason why USB ports are not working lies in the specific device drivers of your USB device. It’s either the specific USB driver is not yet installed on your PC or it has been corrupted. The first thing that you must consider in fixing “USB ports not working” troubles is to make sure that the USB device is properly attached to your PC’s USB port. This method will fix your USB port troubles resulted from unsuccessful interaction between your PC and your USB device. You can also try to reboot your PC before reattaching your USB device. While in some occasions, some PC users tried unplugging their CPU from the power supply, they waited for a couple of minutes before restarting their PC, and then their computer will be able to detect their USB device again. 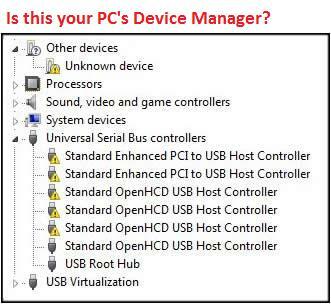 In case that your USB Ports are not Working because of device driver issues such as missing/uninstalled device drivers, you will just need to install the USB controller device drivers on your PC. If the “USB Ports not working” troubles happened all of a sudden, where one possible reason is due to corrupted device drivers, then you must reinstall the USB Port Controller drivers. Having the installation CD of your motherboard is a big help on these occasions, but you can always take the risks (computer viruses, malware, wrong device drivers, et al) to search manually online if you don’t have the installation CD. And as mentioned in our discussion, you must remember that beside the USB controller drivers, there are USB devices that also require specific drivers to be installed on your PC. So, you must also install these specific drivers to let your PC recognize these devices. Examples of such devices include printer, mobile phone, scanner, digital camera, et al. So if you’re wondering “why your PC’s USB Ports are Not Working?”, then you can try one of the manual solutions we tackled in this post. In case that your “USB Ports not working” problem is device driver related, you must install or reinstall the required drivers (USB controller drivers and specific USB device drivers) to get the USB ports working again. If you don’t have the installation CD and you don’t want to take risks and waste your time searching manually online, you can always consider the automatic way to fix device driver related problems with ease.